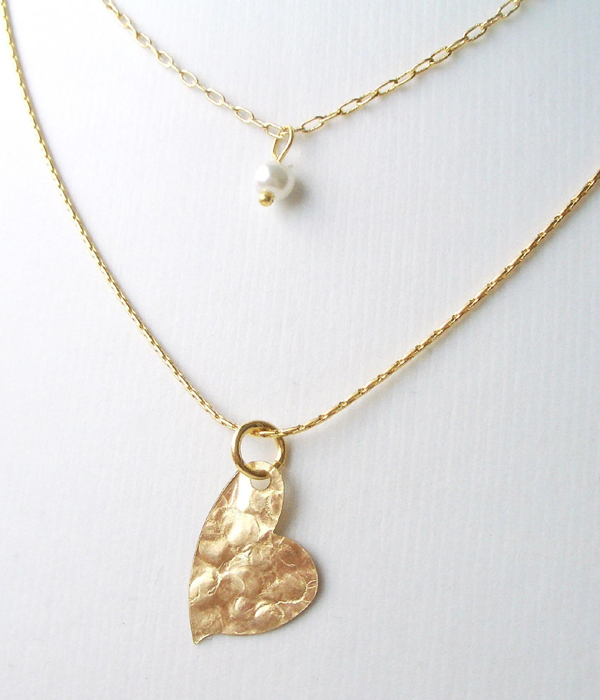 Double-chain necklace with hammered gold heart, pearl charms by Shlomit Ofir. Israeli jewelry designer Shlomit Ofir offers another take on the many-necklaces-in-one theme. In this variation of the classic gold heart necklace, an asymmetrical heart pendant of hammered gold is suspended at the top of one of the heart's curves from the longer of two chains. Hammered gold plate gives the heart (3/4 inch X 1.5 inch, 2 x 1.5 cm) an interesting texture. The shorter chain is ornamented with the simplest of charms, a small round glass pearl.